A book on principles and practices for designing digital applications. Our work involves constantly reconciling use and appearance. This isn't a new or novel struggle; it's inherent to designing, and evident in the gap between applications that look great and those that are highly functional. Digital interfaces rely on common visual design tools to communicate – layout, type, color, and imagery, along with controls and affordances. We've written Visual Usability: Principles and Practices for Designing Digital Applications to provide a common language for defining and evaluating visual user interfaces that's grounded in how people perceive and interpret what they see. Visual Usability provides simple, clear frameworks for designing web and mobile interfaces for meaning and appeal. It helps application design and development teams make interface decisions by focusing on three "meta-principles" we believe form the foundation of great application visual design: consistency, hierarchy, and personality. Each chapter offers guidance on how to make strategic decisions about layout, type, color, imagery, and controls and affordances that will bridge the gap between beautiful and useful applications. We're thrilled to announce that the book is now available on Amazon.com, bn.com, and Elsevier.com! We hope you check it out, and that it provides value to your team. A practical case study shows and discusses design decisions for mobile, web, and tablet applications. Each chapter ends with recommendations for applying guiding principles to your work. "Unlike many simplistic show-and-tell how-tos, this thoughtful, serious, and clearly written book is organized to first provide the logic for design decisions and then the tools to make them. This approach delivers a deep appreciation for designing intuitive digital applications that promote understanding and satisfaction for the user." "This book provides very valuable information on how to improve the usability of visual human-computer interfaces. 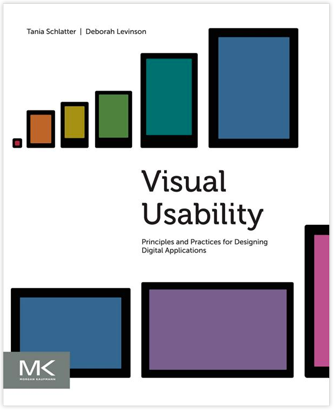 All of the chapters will interest researchers, practitioners, and students of usability, human-computer interaction, interaction design, graphic design, and other related fields who want to know more about the important and expanding area of visual usability." "[A]n excellent choice for the instructor looking for a textbook detailing the major principles and practices of designing Web site or mobile device interfaces. Particularly effective is the authors' running critique of the USDA Web site, SuperTracker, for its strengths and weaknesses in visual usability." Tania Schlatter and Deborah Levinson work with developers and business owners to research and design application interfaces that help people work, find, learn, and connect. Through their firm, Nimble Partners, they have worked with over 15 departments at the Massachusetts Institute of Technology, designed suites of productivity applications, helped launch social good and digital magazine start ups, and consulted with e-commerce sites. Tania and Debby met, and together designed, the first website for a Boston university in 1996. Fortunately, they've learned a lot since then.